(Newser) – Four Confederate monuments that stood in Baltimore on Tuesday morning were no longer there as of Wednesday morning. The city undertook a surprise overnight operation to remove them, with crews starting about 11:30pm and working until the early morning, reports the Baltimore Sun. (See video.) "They needed to come down," says Mayor Catherine Pugh. "My concern is for the safety and security of our people. We moved as quickly as we could." 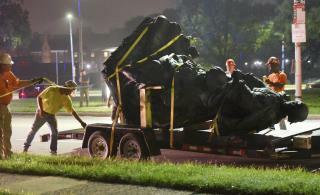 Overshadowing the move, of course, is the violence in Charlottesville, Va., that revolved around the removal of a statue of Gen. Robert E. Lee. One of the statues that came down in Baltimore was of Lee with fellow Confederate Gen. Stonewall Jackson. It had stood in a city park since 1948, notes the New York Times. After the fiasco with the riots and the black lives matter protesters ( including citizens burning their own town) not to mention your city's great attorney Marilyn Mosby. Now we find the brave city government takes down historical monuments in the dark of night ? Oh this was a brilliant idea, don't enforce laws again and give into mob rule ! So what's next on the agenda for the great city of Baltimore ? In some strange way trump is making things happen, by accident, that sane have wanted for years .... and insane conservatives always opposed .... its funny. Just a little question to provoke some thought. Once all the Statues that are associated with the Confederacy are removed, are they next going to remove all the tombstones from the Confederate Cemeteries that list the person buried there was a member of the Confederate Army?